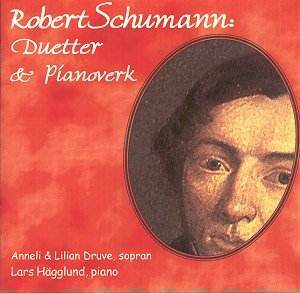 Recorded 18 June 1999, in Studio 12 Swedish Television, Gothenburg (piano works) and 19 June 1999, in Fristad Church. During his short life Robert Schumann composed an enormous amount of music in most genres. He did this in spite of long periods of inactivity, not least caused by the mental instability which also caused his premature death. Moreover he passionately wrote musical criticism and edited his own musical journal. Also, as Stellan Sagvik points out in the booklet, was a prolific writer of letters: he wrote 2500 and received about twice as many. He was a workaholic; witnessed his creative periods including the �song year� 1840 when music literally flowed out of his pen. His solo songs are well known, his duets much less so. On this disc we have eighteen duets, described in the booklet as "Duets for two sopranos and piano"; in many cases they are intended for different voices. The first three, are extracted from the song cycle Spanisches Liederspiel, set for four voices: soprano, contralto, tenor and bass. All in all there are nine songs: two quartets, two solo songs and five duets, three of which are for soprano and contralto. Performed like that we get a much ampler sound while the use of two high voices makes it all thinner, more frail. Moreover, the variety Schumann certainly strived for, and which we get when the song cycle is performed complete, is lost when we are only served the duets. Hearing this many duets in a row, after a while, becomes a monotonous experience. There is also a sameness of mood through much of the program. The texts are mainly nature poetry and so there is a predominant pastoral feeling. It would have been a better idea to present the duets in groups of three or four and interspersed them with piano music instead of having that as an appendix. In this case it probably wouldn�t have worked anyway, since the duets and the piano pieces were recorded in different venues with very different acoustics. What about the execution of the music? The two singers - who actually are twins, which is rare enough in the musical world � have had a solid education and work in a variety of fields in the Gothenburg region of Sweden. Lilian, who has also translated all the texts into Swedish, has also had a sports career. In 1999, the same year as this disc was recorded, she became Swedish Champion in Racketlon (table tennis, squash, badminton and tennis) and she has also been internationally successful, especially in badminton. They both have light, lyrical voices, which blend well - who else should blend better than twins? - and they articulate the texts well. That said, there is very little variety in tone colour and this contributes to the sameness I mentioned earlier. Worse than that, I am sorry to say, is a constant widening of vibrato in one of the voices as soon as it is under pressure, which it is very often above mezzo-forte. The result gives the impression that both singers are out of tune. It might have something to do with the generous bathroom acoustics of Fristad Church. This also affects the piano. It sounds as if the pianist is using the sustaining pedal all the time. I am afraid I haven�t sounded too enthusiastic in this review. However much I admire the boldness and the ambitions I think this enterprise should have been restricted to a more local market. The notes and comments are in Swedish only. But collectors of curios might snap it up for the sake of Träumerei.